And yes! They are so right! which translated word by word would mean rooster’s peak, but has nothing to do with any animal. It is a not very liquid sauce that is served with many, many Mexican dishes. And that for all the right reasons. It is fresh, light, the most delicious thing in the world, tasty, yummy and ahhh you just have to try it yourself. And most importantly: it is super easy to prepare at home! My dear friend Janice from Canada introduced me to Pico de Gallo in 2014 – ever since it has been an ongoing romance. But not until yesterday I thought about actually preparing it at home too. I can get all the ingredients at my local supermarket and it takes only a few minutes and doesn’t require any serious cooking skills. If you like it spicy, add some jalapeños as well. Start by cutting the onion in fine cubes and put them in a bowl. Then take the tomatoes, cut them to dices as well and add them to the bowl. Yeah! Most of the work is already done! Now squeeze half a lime into the bowl, add some salt and pepper. And now the magic begins: Add cilantro! It works wonders! The lime juice already gives it a fresh and uplifting taste, but the cilantro just tops it off! Add plenty, I’d say about a teaspoon or even two! Mix everything well. Final step: enjoy with anything! 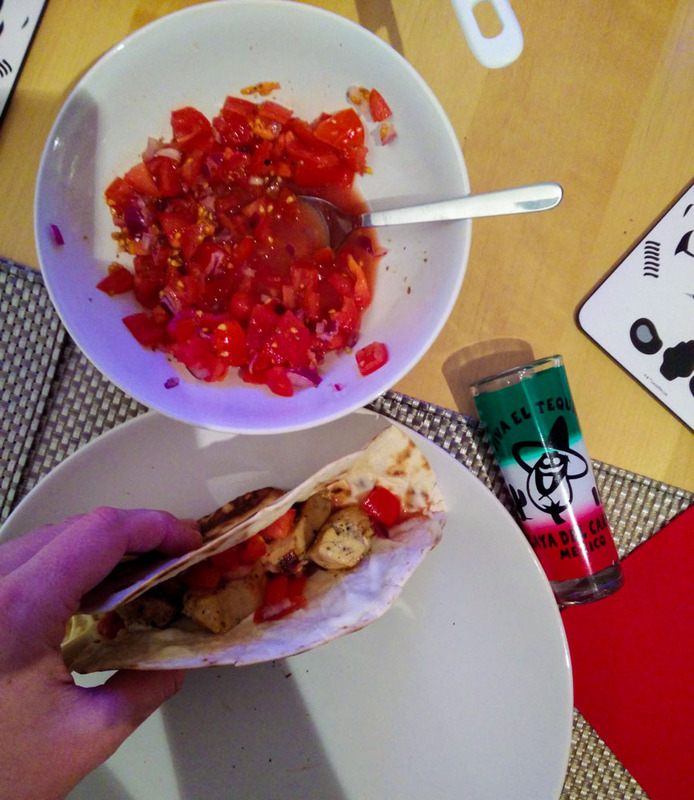 Pico de Gallo works with tacos, quesadillas, but also with pasta, bread, salad, greek yoghurt, …. think of any food – yes, you are able to pair it with Pico de Gallo! It is one of those things that instantly increase the taste of anything. Like bacon or parmesan. I had promised to prepare some Mexican food for dinner. Of course Quesadillas was the ultimate choice, since I had brought the most delicious Queso de Oaxaca (some type of string cheese for the state of Oaxaca in Mexico, it resembles mozzarella cheese, but tastes a lot better). In my head I made a list of what else I’d need to make is super delicious. The Pico de Gallo thought hit me like a bolt of lightning! I HAD to prepare it! There was no other option. So I found myself cutting the tomatoes and onions and adding cilantro, pepper, salt and lime. I mixed it and while my bf was cutting the chicken I let him try a spoonful of the Pico de Gallo. I couldn’t help but laugh wholeheartedly! We aren’t at the „I love you“ stage yet, but it felt so right at this moment and it is exactly the same feeling that rushed my body when I first tried Pico de Gallo in a small restaurant in Mexico in 2014. I gave him a kiss and said te quiero! I couldn’t resist preparing it again the next day and again he said those words!